There is a little bit of misunderstanding that bigger drives come from a much bigger movement, and from speed. 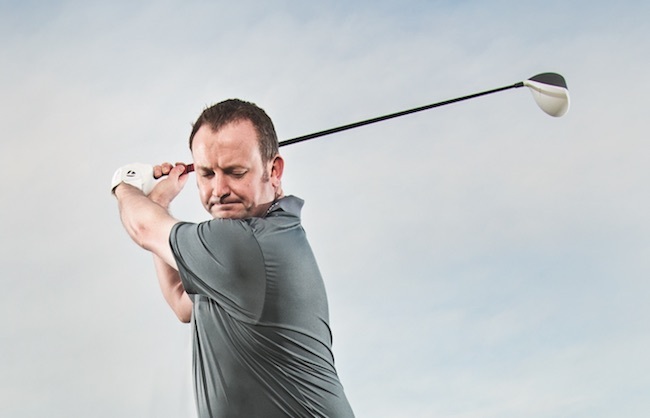 That would be true if everybody hit it out of the centre of the clubface – but for the majority of golfers, the first thing you want to be doing is finding a centre strike. 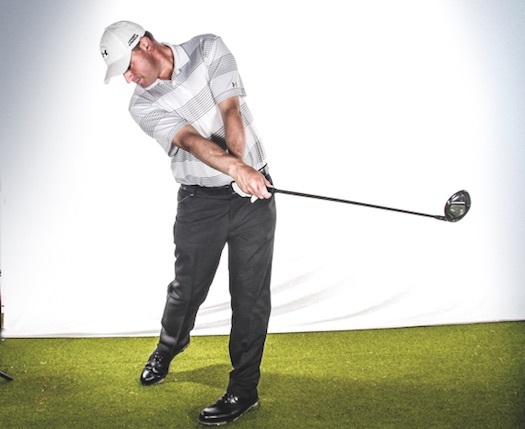 You can swing it quicker but, if you hit it from the extremes of the clubface, you’re not gaining an advantage. 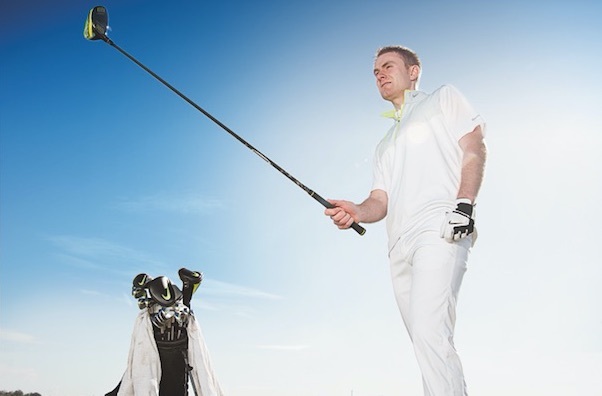 If you are tidier, maybe a little more compact, and you get your body to work more efficiently, you’re going to get more clubhead speed and power, and that’ll add yards. 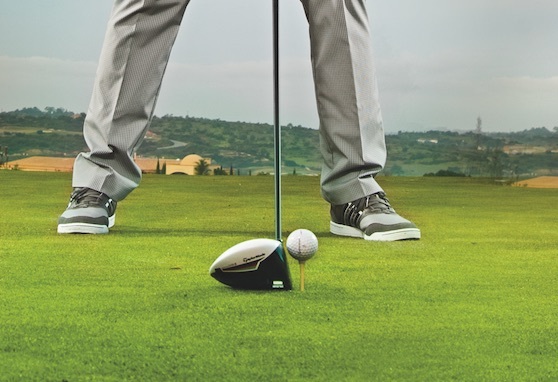 Opening out your left foot a little bit more does two things. 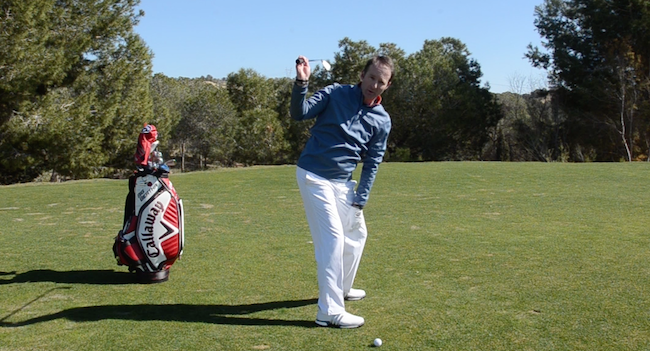 First, it enables you to resist with the hips a little bit more in the backswing, which gives you more stability. This means that when the top half turns there’s going to be a slightly greater separation. 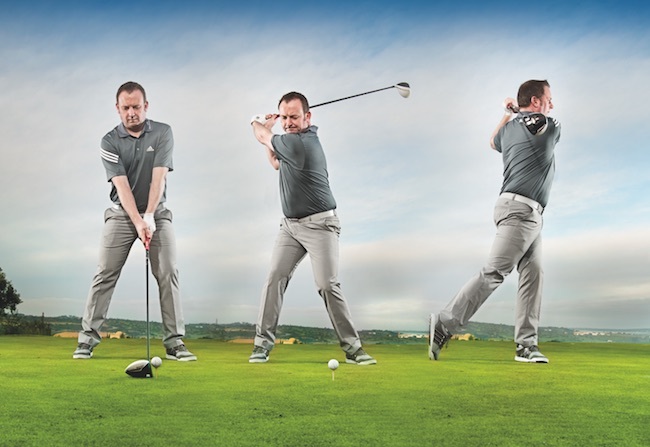 Second, on the follow-through, it’s going to encourage you to turn through the ball a little bit more, so that the club, the body and the ball are working towards the target together. Ultimately, that’s what’s going to give you greater power. It’s like a boxer throwing a punch. Everything has got to work towards the target. You should try to maximise your shoulder turn. I always try and get people to get as much shoulder turn as possible (if they’re able to). The left shoulder, in a perfect world, should sit under your chin. That means you’ve got around a 90º shoulder turn. From front on, you can just about see a little portion of my belt buckle. You’re looking for your hips to resist as much as possible at this point. Be aware, though, that you’re never going to limit hip turn to nothing. Very few people have that range of movement where they can disassociate their hips and shoulders that much. Ideally, you would be looking to try and feel as though the hips resist as much as possible yet stay stable, and that you have kept your knees separated. Try and imagine keeping your belt buckle forward but your left shoulder under the chin. These positions give you maximum torque across your core, and that’s going to give you the elasticity in your swing to deliver more power. On the through swing, you need to be committed. Your sternum should be turning beyond the target and not at it. Occasionally, some players will move about but guys like Justin Rose, Rory McIlroy and Dustin Johnson are predominantly very balanced when driving. Their right foot will be up onto their toe and all the weight is on their front foot – that’s because they don’t need to swing faster for power. Their swings are wonderfully efficient, almost effortless. 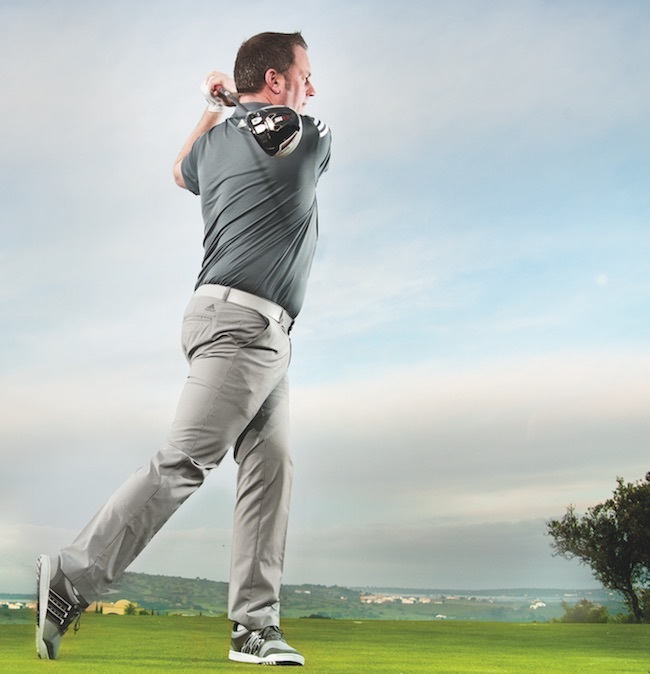 Andrew Jowett is the Head PGA Professional at Gleneagles. For lessons, call Andrew on 01764694343. Follow him on Twitter @andyj1504. Originally published on bunkered on September 20, 2016.